Even if it has a quite big surface, this treehouse was design with material that gives it elegance and lightness. A metallic structure with small pillars help the trees to support the platform of the house. The platform has been partial covered by a bamboo facade and it seems that the house is floating between the branches. The typical straw-roof camouflages itself with the foliage. Finally the metallic stairs are a sort of spider web that unrolls from the platform to the ground. 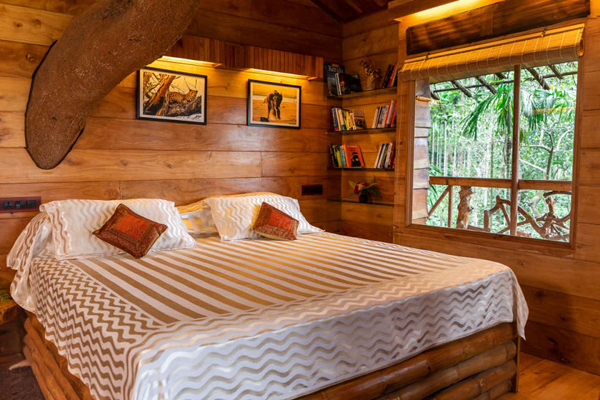 So if you decide to travel to Wayanad, I’ll suggest you a night in this treehouse! For further information, check the Tranquil Resort. Pics by Tranquil Resort. All rights reserved.